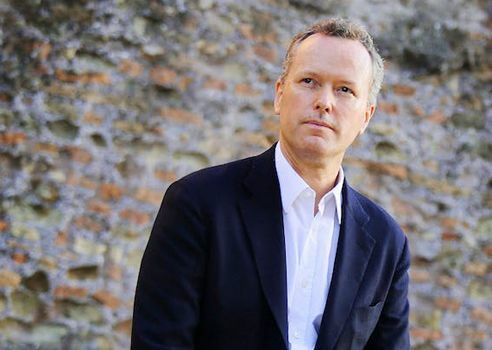 I had never heard of Edward St. Aubyn until earlier this year. News penetrated my dim consciousness when I learned that Benedict Cumberbatch was starring in a five-part miniseries based on St. Aubyn’s Patrick Melrose books. This news gave me inspiration to read. I am still gobsmacked by this man’s talent. St. Aubyn (pictured above) is a spectacularly wealthy English author and journalist most prominent for his semi-autobiographical Patrick Melrose novels, which are based on his own tragic life. He has described an unhappy childhood in which he was repeatedly raped by his abusive father, with the complicity of his mother, from the ages of 5 to 8. I read the first book in the series, Never Mind, hesitantly, given the horror of his life, but St. Aubyn won me over with his superb figurative language. At first she shuddered violently, and then before it even reached her bloodstream, she felt the sharp click of alcohol, filling her with gratitude and warmth. Silent through the sealed windows, she saw black and white magpies burst from the vines, and the needles of the pine trees standing out sharply against the pale sky, swept clean by two days of strong wind. He liked to drink under the blue and gold ceiling of the morning room, where there was always a ripple left by the passage of important men. Dull, dissolute, and obscure members felt buoyed up by this atmosphere of power, as little dinghies bob up and down on their moorings when a big yacht sails out of the harbor they have shared. Without his dark glasses he wore an inattentive expression, until he spotted another person’s vulnerability. Then the look in his eyes hardened like a flexed muscle. Opposite him, the ivy that covered the south side of the house was already steaked with red. He admired the colour. It was a gesture of defiance towards decay, like a man spitting in the face of his torturer. His rather wooden face was covered in the thinnest crack, like the varnish on the Old Masters he had ‘shocked the nation’ by selling. His oyster-coloured complexion and the thick jowls that looked like a permanent attack of mumps were the unhappy setting for a large hooked nose with tufts of intractable hair about the nostrils. When he had met the Wooden Duke he had poured himself out in a rich gurgling rush of compliments, like an overturned bottle of syrup. ‘Well, I’m here now.’ Eleanor greeted Nicholas and Bridget with a flat circular wave, like someone polishing a windowpane.